The Fondation Cartier has opened its doors to the community of mathematicians and invited a number of artists to accompany them. They are the artisans and thinkers, the explorers and builders of this exhibition. They were accompanied by nine artists chosen for their exceptional ability to listen, as well as for their great sense of curiosity and wonder. All of these artists have exhibited at the Fondation Cartier in the past: JEAN-MICHEL ALBEROLA, RAYMOND DEPARDON AND CLAUDINE NOUGARET, TAKESHI KITANO, DAVID LYNCH, BEATRIZ MILHAZES, PATTI SMITH, HIROSHI SUGIMOTO and TADANORI YOKOO, as well as Pierre Buffin and his crew (BUF). They worked together to transform the abstract thinking of mathematics into a stimulating experience for the mind and the senses, an experience accessible to everyone. 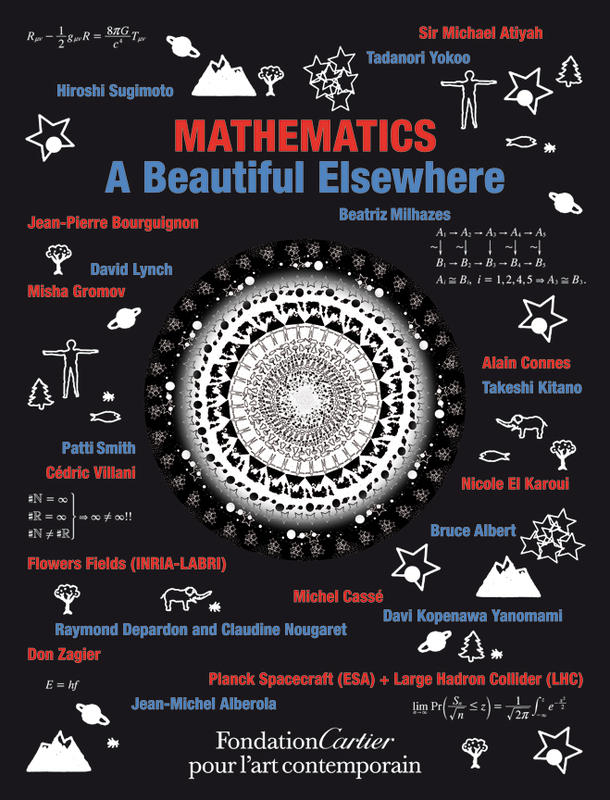 The list of participating mathematicians is extraordinary. Take my word for it. Plus, David Lynch! Patti Smith! Is that cool or what? However, I haven’t gotten far yet in my explorations. I downloaded the iPad app, only to find that it’s overly complicated, not easy to navigate, and crashes. (Yes, there’s an iPad app, “designed to complement the exhibition Mathematics: A Beautiful Elsewhere. It features the contributions of the exhibition’s scientists, as well as those of its artists, and includes videos, images and texts from their past exhibits at the Fondation Cartier.”) Maybe I should wait for the exhibition catalogue, which is due out May 1. You may have better luck. I suggest you take a look at the website, try the iPad (if you have one) app, and discover for yourself the beauty of math and the artists’ takes on it. I’ll keep trying.